Blastwave is an unapologetic repaint of the upcoming Bludgeon toy in the Robots in Disguise toyline. For some reason he was released first, making not a lot of sense. 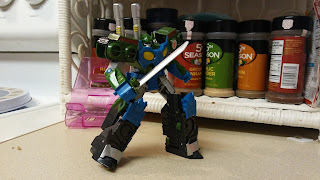 Though Blastwave IS a very good toy. So it stands to reason Bludgeon will be too. In fact, Blastwave/Bludgeon is a retool of the Megatronus toy from last year. Seeing as Megatronus was a good toy, it stands to reason the retooling should also be. Blastwave transforms into an H tank with double barrel cannons. It's a solid alt mode, though I do not enjoy transforming a bit. It's not hard or anything, just doesn't work out in a pleasing way. I find myself wanting to be done as soon as possible. However as a tank, he's good enough. It's not a very remarkable tank, but not a bad one either. 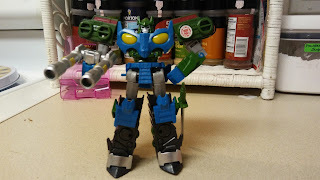 In robot mode, Blastwave is a green and blue Bludgeon. There's no hiding that. If his face was painted another color it could have maybe been more disctinct. As is, Blastwave still looks really good. He's a solid robot and has a fair amount of articulation. If I had any complaint, his chest ornamentation can block shoulder movement a little. That and it's pretty east to knock parts loose from place. I found myself accidentally knocking his head loose while transforming as well as his chest. 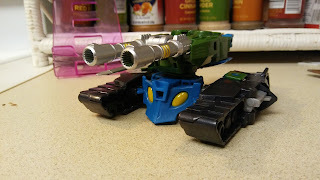 His tank cannons can be knocked out pretty eaily too. I'm not sure if that's just my toy or if all of the figures have the same issue. In all, Blastwave is a very good figure. He just needs a little tightening up in a few places.